Data is from the August 2018 Sizmek "Marketers Survey Results 2018: An Insider's Look at Media, Brand Safety, and Partnerships." 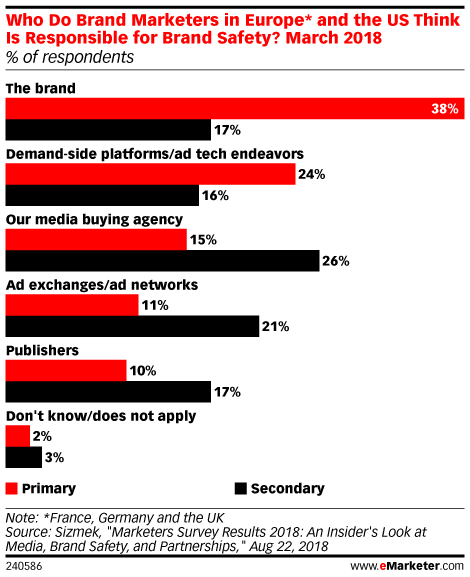 522 brand marketers from various industries in France, Germany, the UK and the US were surveyed by Qualtrics in March 2018. Respondents were decision-makers or influencers for the advertising and marketing budget for their company in 2018. They identified their position at their company as C-level (27%), director (18%), head of a department (21%), manager (22%) and VP (12%). Respondents identified the number of employees at their company as 2-99 (6%), 100-999 (29%), 1,000-4,999 (32%), 5,000-19,999 (22%) or 20,000 or more (9%) with annual company revenues of $1-$100 million (29%), $100 million-$1 billion (30%), $1-$5 billion (26%) or $5 billion or more (13%) with an annual digital media budget of less than $100,000 (7%), $100,000-$500,000 (22%), $500,000-$1 million (32%), $1-$5 million (28%) or $5 million or more (10%). Sizmek is an omnichannel digital advertising platform.